Location is dumpster outside in parking lot and surrounding area. Dead rats on the ground and live rats scurrying about. The Foley apartments routinely has trash overflowing from dumpster. Dumpster is never shut closed. 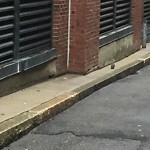 There are numerous rats feeding and living in the garage beneath 1721 Centre St. We now see them daily crawling in and out of the garage. Big rat roaming the street! Please bait, seen coming from alley across from 21 Salutation St where trash is kept!